The unmanned Russian Progress 42 cargo ship is seen by a video camera on the exterior of the International Space Station just before docking on April 29, 2011. An unmanned Russian cargo ship arrived at the International Space Station today (April 29), just over five hours before NASA's planned launch of the shuttle Endeavour toward the same destination in orbit. 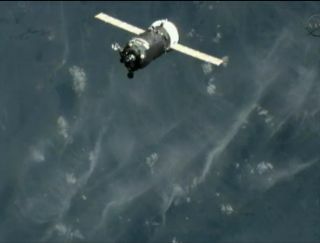 The robotic Progress 42 cargo ship linked up with the space station at 10:28 a.m. EDT (1428 GMT) as the two spacecraft sailed 220 miles (354 kilometers) over western Mongolia. The cargo ship delivered more than 3 tons of supplies, equipment and other gear for the space station's six-person crew. The orbital rendezvous came two days after the Progress 42 spacecraft's launch from Baikonur Cosmodrome in Kazakhstan and five hours before NASA's planned liftoff of space shuttle Endeavour. The mission will be the final flight of shuttle Endeavour and NASA's next-to-last shuttle mission before the 30-year-old program shuts down for good later this year. Endeavour will deliver a $2 billion astrophysics experiment and spare parts during the mission. Four spacewalks are planned. Endeavour was originally slated to launch on April 19, but NASA delayed the launch by 10 days to avoid a space traffic conflict with the Progress 42 spacecraft's flight. Russia's Federal Space Agency packed Progress 42 with 1,940 pounds (880 kilograms) of propellant, 110 pounds (50 kg) of oxygen and air, 926 pounds (420 kg) of water and 2,976 pounds (1,349 kg) of maintenance hardware, experiment equipment and resupply items for the space station's crew. Russia's Progress spacecraft resemble the country's three-module Soyuz capsules that carry cosmonauts and astronauts into orbit. Progress vehicles, however, carry a fuel pod in place of a crew module in order to replenish the space station's supplies. Progress vehicles are disposable and routinely burn up in Earth's atmosphere once their missions are complete.